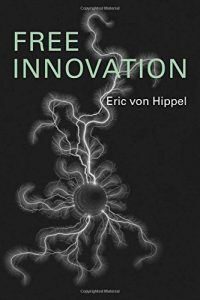 I polished off Eric von Hippel’s Free Innovation on my Washington trip. It’s an interesting, short book looking at the viability and character of innovation by individuals – alone or co-operating in communities. It is free in two senses: the work involved is not paid; and the innovations – or at least their design – is not charged for, although it may subsequently be commercialised by the inventors or by other businesses. The viability of free innovation has been greatly extended by digital technology and the internet: there is more accessible useful information, it is easier and cheaper to co-ordinate among a group. The diffusion of innovations is also easier, although rarely as extensive as when a commercial business takes them up and markets them. In fact, von Hippel argues that there are some strong complementarities between free innovation and commercial vendors, as the latter can bring the scale economies of production and marketing, while the former can enhance the use case, the complementary know-how, that increase the value of whatever it is. The book has a little theorising, some survey evidence on the wide scope of free innovation, and plenty of nice examples. It ends with a couple of chapters on how to safeguard the legal rights of free innovation and how the pehnomenon might be encouraged. The scope is what interests me particularly. I had already been thinking about phenomena such as open source software as a voluntary public good, which competes with marketed goods – compare Apache with Microsoft’s server software (as Shane Greenstein and Frank Nagle do here). There is clearly a growing amount of substitution across the production boundary going on. The surveys reported in this book seem to indicate that millions of people are innovating (5-6% of respondents in the UK and US, Finland and Canada) – but equally, some of the innovations are minor contributors to economic welfare and one cannot imagine them ever having a wide market or competing with marketed equivalents. The question is how to get a handle on the scope and scale of all the open source, public good, innovation. This entry was posted in Main Page and tagged GDP, innovation, review by Diane Coyle. Bookmark the permalink.